What Is Required to Become an RN? What Are the Education Requirements for RNs? The education requirements to become a registered nurse (RN) differ in emphasis depending on what kind of nursing program you attend. In each case, you will take the National Council Licensure Exam for Registered Nurses (NCLEX-RN) upon graduation to become licensed as a registered nurse. The education requirements of the three types of programs differ in intent and emphasis. These are the kinds of courses you will take in the different programs. These programs equip nurses to work as part of a medical team in a hospital or inpatient facility and emphasize patient bedside care. Students begin clinical training from the start of their program and build strong clinical skills. The class sizes are generally small. Some programs provide experience in specialized settings such as neonatal, pediatric, obstetric, surgical or psychiatric. Many of these programs have an arrangement with a community college to provide the coursework. Some will allow students to complete additional coursework to earn an Associate degree (ADN) as well as the Diploma. Hospital Based Schools of Nursing are fewer in number than college programs, but there are advantages to pursuing this type of program. The benefits are: more extensive clinical experience and working within a healthcare team, possibilities of tuition forgiveness and of being hired at the hospital, and a small student to faculty ratio. There are over 1800 colleges offering the ADN program in the U.S., mostly in community or technical colleges, but some at four year universities. Community colleges were set up to provide the first two years of a four-year degree, and the ADN program will include general education courses that can be transferred toward a BSN. In general, entry into a Nursing program will require certain prerequisites which may or may not have been completed in the high school program. These include English, math and science courses and some courses in the social sciences and humanities. The advantages of the ADN program are shorter duration of study, less cost and availability. Courses can be transferred toward a four-year program, and there are numerous RN-to-BSN programs of 12 to 18 months should you decide to continue toward the higher degree. The ADN program gets you working, learning on the job and earning sooner than the BSN. Work experience carries a heavy weight when seeking employment. Some hospitals have a tuition reimbursement program for RN employees studying for higher degrees. There are over 700 BSN programs in the U.S. that educate students over four years for entry into professional nursing. There are also almost as many RN to BSN programs for nurses who have the Diploma or ADN who wish to fast track to a BSN, and over 250 Accelerated or Second Degree BSN programs for bachelor’s degree graduates with non-nursing majors. Because of the complexity of modern medicine and the fast changes that are occurring in the healthcare industry, there is a push to expand the number of bachelor’s degree prepared nurses in the field. Nurses are expected to undertake leadership, education, research, coordination and decision-making roles as well as patient care. The BSN programs attempt to prepare students for these expanded roles. Besides the courses listed for ADNs, the following are some of the courses that BSN program students will encounter. 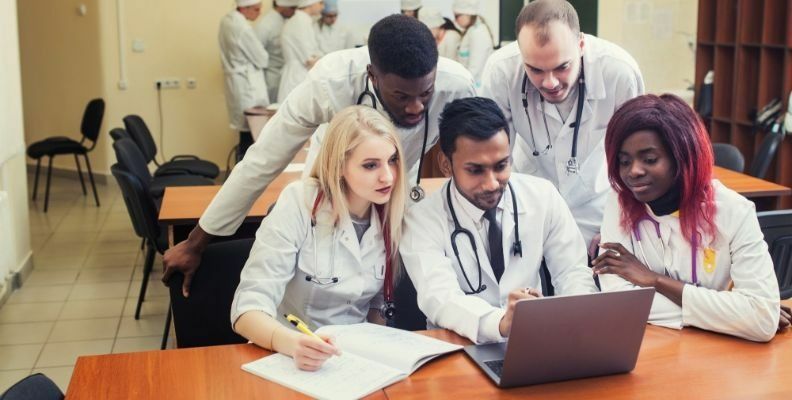 The RN with a BSN is increasingly seen as the entry level professional nurse; more and more employers, including federal agencies, are requiring the BSN when hiring. A BSN qualifies an RN to undertake management positions in different settings. The able BSN nurse has almost unlimited opportunities to expand into different healthcare opportunities. This includes undertaking graduate study at the MSN or Doctorate levels. To get started with your own nursing education, contact the schools below for program details. © 2008-2019 BestNursingDegree.com All rights reserved. Sign up for news & updates from Best Nursing Degree.